Click photo to enlarge , a new window will open, click that one as well. 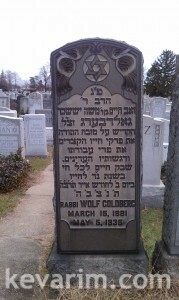 Rabbi Chayim Ze’ev Wolf Goldberg, was born in Kolna, Poland, to poor parents who eked out a meager survival from carpentry. Even though he was a young adolescent, he learned in the yeshivas of Lomza and Slobodka. Later he moved to the Etz Chayim yeshiva in Slutsk. His wife was Hod’l, daughter of Kadish der Melamed. When he was ordained as a rabbi, he acceded to the request of the illustrious Reb Moshe Mordecai Epstein to travel to America and raise funds for the Slobodka yeshiva. The New World and its democratic institutions found favor in his eyes, and he almost decided to remain there and serve as a rabbi. But he returned to Slutsk. He chose not to make the Torah his means of livelihood. He did not return to the rabbinate upon coming back to Slutsk. He tried his hand at business, but since he never really understood the ways of commerce, he made nothing. Most of his time was spent in the study of Torah and books of Jewish ethics. The outbreak of World War I opened many opportunities for massive assistance to Jews in distress. Abba took upon himself the responsibility for helping unfortunate co-religionists who suffered effects of the war. This was the acme of his activities during those “days of awe.” The large local population of paupers was swollen by refugees who fled border towns – entire families lacking all necessities, some of them affluent Jews who had lost their fortunes, women whose husbands had been conscripted into army service, leaving them and their children destitute, without means of support. Infectious illnesses swept through the town. The problems of providing food, clothing, shelter, and medicine for the refugees occupied the energies of the triumvirate which devoted itself to public aid: Dr. Shildkraut, father and patron to all the inhabitants of the town, Reb Yeshaya Mendel Deretzin, an energetic public figure with a noble heart, and my father and teacher. Daily they would supply flour or bread to the needy. Every Friday morning they would distribute two challahs for lechem mishneh for the Shabbat meals. (If my memory does not deceive me, the distribution took place in the Linat Tzedek office in the Cold Shul.). Father would ‘hide’ a few challahs to give secretly to householders who had lost everything, or to scholars and members of prominent families, so as to spare them the embarrassment of waiting in the queue. Although father was rigid in religious matters, he valued the study of the Hebrew language and Jewish literature, and did not prevent me from studying Tanakh and reading modern Hebrew literature. With the Bolshevik revolution, the situation in the city took a turn for the worse. The war between the Bolsheviks and the Poles brought ruination. When the former advanced, the town faced the danger of starvation, illness, and fear for the future of religious life. When the Poles advanced, life itself was threatened. The troops of the “Lerchikim” and the “Poznatchikim” molested Jews, killed them, wounded them, and plucked beards. Jews were hurled from trains. Many were murdered by hooligans in neighboring villages and brought to Slutsk for burial. Father fled to America. After three years he was able to bring over his family. But his connection with Slutsk did not cease; he helped support the yeshivas in Slutsk and in Kletsk. This is attested to by letters in my possession written by Reb Aharon Kotler and Reb Asher Sandomirsky, who was spiritual mentor in the Etz Chayim of Slutsk. Father died in New York in 1935.